This exhibition demonstrates various methods by which food production can be incorporated into the urban environment at both an industrial and domestic level. It hopes to raise public awareness of our increasingly fragile relationship with the food on which we rely on and the method of bringing it to our table. Access to Nature is a £25 million grant scheme to encourage people from all backgrounds to understand, access and enjoy our natural environment. 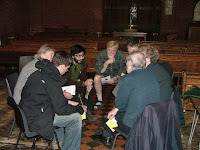 Both courses organized by Naturewise in collaboration with Friends of Tottenham Marshes. Vegetable landrace survey – Can you help? The Universities of Birmingham & Warwick, with funding from Defra, are carrying out a survey of traditional vegetable varieties grown in England and Wales because of their historical and cultural value, but also to conserve the full range of diversity of the UK´s crop plants. 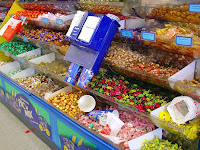 A pic'n'mix of information sent in my members lately, in a little rush of enthusiasm after coming to the film screening. (Really we call anyone with even a passing interest a member - it's not a strict membership organisation, so you're very welcome.) There might be something here you find interesting. "It is free to download off the web and is very accessible and well written I am finding it very easy to read in clear language that is designed for people who do not necessarily have a technical back ground- it comes highly recommended." Also http://www.parityprojects.com/default.htm is worth a look. Russell Smith has experimented with a Victorian terraced house to find out what would need to be done for the house to become highly efficient. It is a case study of sorts in Hackbridge. The whole house is being very closely monitored and more can be found out on the website. He also has some ideas for how multiple houses can be retro fitted at the same time, reducing costs and also planning work around the home so that two jobs can be done at once; fitting a new bathroom and fitting water saving devices at the at the same time for example. Russell explains this much better on his website than me however. This is really interesting, because it's clear that Westcombe has a surprising number of people interested in and/or with expertise in energy issues. You might have seen an article in the Westcombe News lately about the difficulties - bureaucratic and technical - in retrofitting older houses, of which we have plenty here. You can find the article on page 7 of this edition (pdf file). We should give proper thought soon to how to start getting people in touch to form subject groups - Energy, Food and so on, because there's clearly enough knowledge and interest out there that if heads are put together, things can get done. 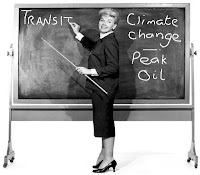 about peak oil! Check out his blog. Jon has emailed to alert everyone to this 6 April London Sustainability Exchange event, for anyone with an interest in food. If anyone goes, get in touch afterwards to let us know about it. Jakki has been in touch to illustrate an extraordinary food-growing system she was trying to describe in one of the group discussions on Wednesday. She points us to this site, which might be of interest if you want to grow but you're lacking space or soil. She adds of the man behind this idea: "If ever you have an hour to spare, he would love to give you a conducted tour of his allotment." 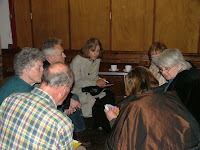 "Many thanks for the film and the opportunity to chat to other interested people.What an excellent turnout wasn't it! ... The woman sitting next to me before the film had been to Cuba twice - her daughter studied there for a year - and her experiences very much echoed the film." available online?) Here you go: Power of Community website. I don't think you can watch it online, but you can buy it and if you want to put on your own public screening, they don't put any licensing restrictions on it if you're doing it not-for-profit. "Thanks very much for last night, well run and organised and a great start with such a good turnout." Thanks everyone. Keep in touch. If you missed our screening of 'The Power of Community', you can learn about Cuba's peak oil moment and about whether we can feed ourselves through urban agriculture, by listening to a recent edition of Radio 4's Food Programme via the 'Listen Again' feature on the R4 website. One of the guests is Ben Reynolds, a local from Blackheath who recently gave a great talk to the Friends of Greenwich Park about urban food projects. Can rooftops and railway sidings feed cities? 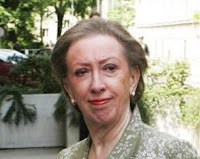 Sheila Dillon looks to London and Cuba to find out. What is the potential for growing our own food? Sheila Dillon looks at the Mayor of London’s new project to make more land available for food production. She also looks at the experience of Cuba where political and economic change forced the population to attempt an “organic revolution” as the country struggled to produce enough food to survive. One response was to grow more food in urban areas. This experience has struck a chord with UK groups interested in "peak oil" food production, and the film The Power of Community: How Cuba survived Peak Oil has toured the UK to enthusiastic audiences. So what can we learn from Cuba and how productive could urban farming be in the UK? Madelaine Vasquez, food researcher, writer and presenter of the weekly TV programme "Con Sabor"
Ben Reynolds, coordinator of Capital Growth , a scheme launched last November by London mayor Boris Johnson and the woman he appointed to be the chair of London Food, Rosie Boycott. Thanks to everyone who came along to our first public event on Wednesday – a screening of the documentary, ‘The Power of Community – How Cuba Survived Peak Oil’. 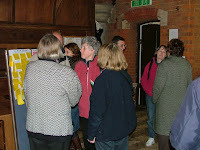 Just under 50 people turned out, and there was plenty of milling and mingling, and a great atmosphere. A big thank you to St George’s in Glenluce Road, who made the church available to us for the evening, and gave us lots of practical help we couldn’t have done without. It’s a great example of a church as a living, breathing hub of the community. The film shows how Cuba was crippled when its oil imports were cut off by the collapse of its main supplier, the Soviet Union, in the early 1990s – but also how the Cuban people responded creatively and resourcefully to survive such an unimaginable crisis, turning to urban, organic and permaculture agriculture, revolutionising public transport, importing bicycles, investing in renewable energy, reforming town planning to help people work closer to home and – underpinning all this – embracing a spirit of co-operation. - What can I as an individual do to prepare for and lessen my vulnerability to the end of cheap, abundant oil? 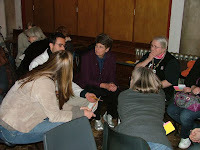 - What can we as a community do? Then all these ideas were written onto post-it notes and stuck up so we could browse each other’s thoughts. 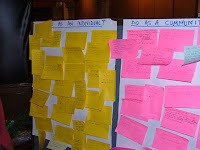 And a third set of post-its were used for people to make any other comments or ask questions. And someone suggested “Workshops on eco-psychology” – perhaps an offer, or perhaps a suggestion for a group that might help some people to process, on a personal level, the big changes we have to come to terms with? We pointed out after the film, that taking action as an individual can be quite an overwhelming prospect – so it was great to see people tackle this and make suggestions with gusto. Part 2, coming soon: What you suggested that we could do as a community. And after that, we'll try to answer the questions you put. Some of you have also been emailing useful or interesting links and information, which we'll also post here. And please feel free to make use of the comments facility immediately below if you want to say what you thought of the film, the discussion or transition issues in generally. One of our members has blogged about Transition Westcombe's first public event - a screening of 'The Power of Community: How Cuba Survived Peak Oil' - which we held on Wednesday night. Click here. 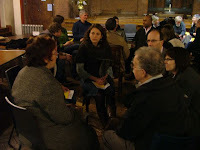 Thanks to the nearly 50 people who gave up their weekday evening to come along, and to those who took part in the discussion afterwards. We'll put a full report here as soon as we can, featuring your suggestions for what you and the community can do to combat peak oil and climate change, and hopefully to answer whatever questions you posed, too. Don't forget our next event on 8 April. This - "Green apprentices wanted for £1m scheme" - looks promising, and the good news is that Greenwich is one of the 47 councils getting a share of £1m (that's about £21k each) to sign up apprentices to tend our parks and green spaces - announced by the perennial Margaret Beckett this week. It's not a large amount, but it's something. 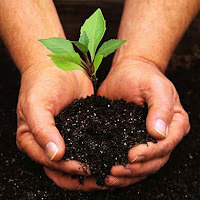 But - without wanting to quibble too much with something positive - wouldn't it have been far more useful and imaginative to pay for, say, an army of grow-your-own trainers to go out and help householders to start growing their own food at home? Or to put a food-growing spin on the apprenticeships and give them the mission to find ways in which our public spaces can be partly turned over to local food production, with local people's involvement? This might provide even more employment than a few apprenticeships and bring in some money to help sustain the scheme in the longer-term. Or follow the lead of Transition Town Totnes. As part of their aim to make Totnes the 'nut tree capital of Britain' they are training up tree guardians to tend their nut trees. I believe they are resident volunteers, but food security is important enough that we should spend money on employing people to do this kind of work. It would be great if Greenwich could take a lead on this and insert a food-growing remit into the job description of the apprentices it takes on. And perhaps add an ambitious goal that would get local people excited and involved: 'The pear and plum tree borough'? A chestnut product-producing plant to make full use of the annual conker boon in Greenwich Park? Any other suggestions? Transition initiatives aim to be far more than just talking (or blogging) shops. Which is why we're holding a projects-pitching event on Wednesday 8 April. Do you have a great idea for a community project but need others to help put it into action? Or do you have knowledge, time or energy to offer a great project – if the right one comes along? Come and pitch your idea at the Brainwave Bazaar and inspire others to join you. 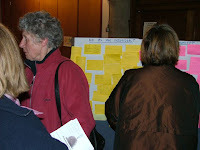 Or browse the ideas on offer, choose to get involved or just enjoy the exchange of ideas as a spectator. The only rule is that project ideas should help to cut our dependence on oil, or cut CO2. If they save people money and bring the Westcombe Park / Greenwich community together, too, then all the better. Check out some of the things other transition towns have been up to for inspiration by clicking here. For anyone who really wants to get involved in a transition initiative, there is a good opportunity coming up: a training weekend run by the Transition Network. These don't often come as close to us as Brighton, so if there are places left and you are serious about getting involved, this one is worth considering. Their blurb is below. It is considered essential that at least two, or for larger groups, several people undertake this course for any transition initiative, and it gives a deep understanding of the core principles of starting or maintaining a Transition group, and the skills and tools needed. It is a profound journey into building our personal resilience, while weaving together our inner Transition with Transition on a community level and sharing the experiences of other initiatives. It is highly recommended and is likely to result in excitement and effective action, with participants likely to return to their groups with new found gusto and wisdom. It is valuable for those who have already been involved for some time, or those who are new but committed to helping their community make the Transition to a decarbonised and generally happier future. With the explosion of the Transition movement, the trainers are now in high demand, with this course now going on international tour and the closest taking place in London, every now and then. They tend to book up quickly. We have worked very hard to keep the cost of this course to £90, with limited concession places available. There will be a limit of 22 places only. Please write to bookings@transitionbrightonandhove.org.uk in the first instance, for further details, including how to pay the £40 deposit to secure your place. 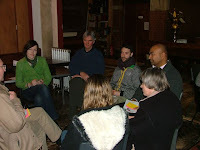 Please tell us a bit about yourself and your involvement with the Transition Towns movement. Warm regards...and keep up the good work! Greenwich's Village Market, after having the axe hang over it for so long, is reportedly closing for the last time after this weekend. To be clear, the Village Market is the big, sprawling one between Stockwell Street and King William Walk. Not the bijou covered craft market, or the little flea market by the Picturehouse. We're talking, for a lot of people, about the main event - the draw that brings many to Greenwich town centre in the first place. The treasure trove where you can spend hours rummaging the second-hand furniture and clothes, bric a brac, records, artwork and assorted miscellany, shoot the breeze with stallholders and get a cup of fantastic coffee from the ever-smiling coffee man. Greenwich Council last year gave planning permission to its owner for a glossy, glassy new development of flats and shops to take its place, mostly retail (no doubt flashy fashion chains and the like), with a rather tokenistic provision for a few stalls that would in no way make up for the loss of the market as a whole. Intriguingly, rumours have been flying that ownership has since changed, though the University has apparently denied rumours that it has bought the site. Perhaps the original owner's plans went the way of the economy: real estate and retail is not, at this point, a safe investment bet. 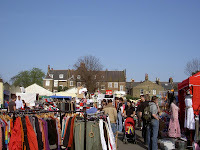 But instead of the market traders being given a stay of execution, this is reportedly to be its last weekend. Which means we may find the site goes unused for the foreseeable future, even though it could have trundled on its merry way until a future for the site is decided, providing pleasure, adventure and employment to many. Last year I heard I heard one councillor describe the market as 'shabby' or some similar put-down, which I thought showed a disappointing failure to see this amazing market's charm, and showed a rather narrow idea of what 'development' should mean. See you there this weekend, perhaps with a black armband. But I can't promise I'll be back in Greenwich town centre nearly as often after this. Unfortunately unless they can be large-scale money-spinners, sites like these simply aren't seen as assets by those with the power to preserve them. But the death of this market is going against the economic tide, which is increasingly against corporate blandness. Fingers crossed that somehow, somewhere the Village Market can be raised from the dead. We will be able to give away free low-energy lightbulbs to the first 16 people who arrive at our free film screening on 25 March, so if you're able to come, arrive at 7.30pm or even a little earlier and you'll stand a good chance of picking one up for yourself. If you haven't heard about the film screening yet, click here for details and please spread the word to whoever you think might be interested. All welcome. One of the most daunting prospects about the end of cheap and easy oil is how businesses can survive. Like the rest of us, and perhaps even more fundamentally, even local businesses tend to depend upon long supply chains, road and air freight. And really, isn't this anti-consumption lark working against their interests? Well we'll always want and need to trade, but it is a challenge, and it will require a brave and imaginative leap for many local business people. As ever, it's good to have a model, and here's one not far from Westcombe. Chris Carey's Collections provides textile recycling banks to councils, schools and companies (textiles now account for a large proporition of our landfill waste), sort the collections for re-use and selling-on and even sell on some of the clothes to local people in their Deptford boutique. Theatre, film and TV costume hunters are also customers. The company seems too to have a social aspect, with human clothing pickers employed instead of machines "as we believe in providing local employment" and they run schemes to get the long-term unemployed back to work. Some good transition principles in action there: using others' waste as raw materials; recycling; re-use; supporting the community. Greenwich Community College tells us that Chris Carey will be running a stall at the Frock Exchange on 21 March, where he (or she?) can explain the recycling process to anyone who might be interested. This is a rather nifty art project making an important point: that there isn't much provision for food-growing on the peninsula (again I'm straying outside Westcombe issues, apologies). It culminated in a community feast at which locals harvested, cooked and ate the food they'd grown themselves. It was done in collaboration with Stream Arts, which sounds like a great organisation, with its eye seriously on art but apparently informed by a driving principle that it involves the community in projects which benefit local people. Thumbs up. A public art project on the Greenwich Peninsula, created by artist Kerry Morrison in collaboration with local residents, schoolchildren and their families, as part of Stream's Peninsula programme of commissions. The artist researched environmental issues on the Peninsula, engaging with residents and experts in ecology, regeneration, agriculture, local history and weather systems. The current regeneration of the area, with few if any spaces to "grow your own", and its history of marketing gardening and cultivating cauliflowers, provided the inspiration for the project. The artist worked with local residents to create a public allotment in the shadow of the 02 and to grow 100 cauliflowers, which were harvested, cooked and eaten at a community feast in May 2008, alongside other events and workshops. Click here for the project site. The organisers of the 21 March Frock Exchange 'swishing' event have been in touch with more information. Click on the image to the left to see the poster in detail. We are partnering up with the Greenwich and Bexley Cottage Hospice Shop, sustainable fashion designer Inkeri Medley www.inkeri.co.uk who is based at Cockpit Arts and Mary Jane Baxter Millinery (Mary is an ex BBC Journalist who recycles lots of vintage fabrics, buckles and buttons on to her hats. She sells her hats at Harvey Nichols). Greenwich and Bexley Hospice Retail shops ensure that none of their items end up in landfill. So there are some interesting groups adding to the mix on the day and all are on hand to give advice on the day of the Frock Exchange 12 noon until 4pm Saturday 21st March. Inkeri Medley is going to be running a two day workshop where you can learn, with the aid of a sewing machine, how to revamp an existing item of clothing. We are on a bit of a ‘make do and mend’ drive. Hence the principles of the Frock Exchange. Once again, all this chimes perfectly with transition principles: Learning valuable new (or forgotten) skills to make us more self-reliant, saving money of course, and, not least, fun. This isn't a Transition Westcombe event, but it's impeccably 'transition' in its principles, and it's something we'd talked about holding in Westcombe: There will be a 'swishing' event at Greenwich Community College on 21 March. The principle is 'swap, don't shop' - women (why not men?) are encouraged to bring along an item of clothing to give away, and while there they can take their pick of others' cast-offs. But it shouldn't be any old tat, but something they would be "proud to hand on", perhaps designer wear that has been outgrown or just doesn't seem to suit any more. The idea began when a group of people "put their heads together to find a way to combine a love of retail shopping without contributing to increased consumption". I think we can endorse that pretty happily. Low-carbon, low-consumption shouldn't mean wearing hairshirts, and should be as fun as this sounds. When I last wrote about this film, The Age of Stupid, tickets weren't quite on sale, so if you tried you might have been frustrated. They're on sale now if you call 0871 22 44 007 and negotiate the Odeon's slightly long-winded automated box office. It's worth repeating, too, that if enough people see the film in its first week it will give the film a good chance of getting an extended run. If they don't, it might sink without trace. We've received this message from Capital Growth, below, which I blogged about not long ago. If you've got an idea for turning an underused patch of ground into a community food-growing project, Capital Growth seem keen as mustard to help you out. You might want to get in touch with them, attend this event - and then let us know what you learned. Capital Growth is holding a free networking event for anyone involved or interested in setting up a community food growing space in London. The event will be held in Somers Town Community Centre in Camden between 6.30 and 8.30pm on the 19th March. Food and drink will be served. For a map of the location see http://www.multimap.com/s/i9E5Twht. Book now as places will be limited on a first-come first-served basis! If you would like to attend please contact katedunlop@sustainweb.org with your name, email address and telephone number by Monday, 9th March. For further information please contact Capital Growth on 0207 837 1228, visit www.capitalgrowth.org or download the event invitation as a 1077kb PDF at www.capitalgrowth.org/pdfs/cg_invite_feb09.pdf.